For our purposes, there are three basic parts to the toilet: the bowl, the cistern, and the flushing assembly. The bowl is the part where your gigantic log is festering. The cistern is behind the seat, and fills with water. 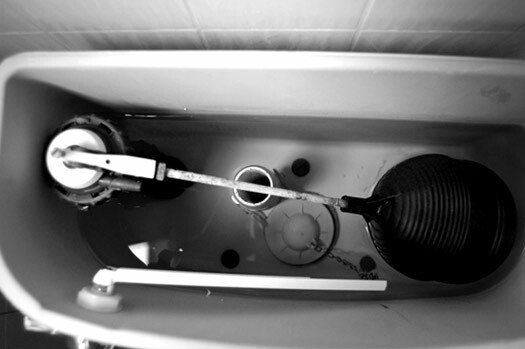 The flushing assembly consists of a) the flush handle; b) a gasket, which looks like a hatch in the bottom of the cistern; c) a chain, connecting the flush handle to the hatch; and d) a float, which usually looks like a big ball attached to a stick. A different type of float looks a little bit like the Space Needle, and rides up and down on a tube, but the idea is the same. When a toilet is working properly, the flush handle puts tension on the chain, which lifts the hatch. The hatch, now open, drops a gallon or two of water into the bowl. Gravity forces all this water, along with your Number Two, down into the sewer pipes. This causes the float to drop, which turns on a stream of water to refill the cistern. As the water fills, the float rises. When the float reaches the top, water shuts off. Simple, right? Lift the lid off the cistern, and take a look inside. It should always either be full of water, or filling with water, but we'll get to that in a minute. Don't be afraid to stick your hands in the cistern water. Pranks aside, no poop ever gets inside the cistern. In fact, the cistern water is relatively clean. Gravity, remember? With that in mind, let's get back to the problem at hand. Is she still pouring the orange juice? Good. Let's get started. Problem: My poo is stuck and the bowl is really full. This is the most common cause of a stuck toilet. Your turd is so dense that it's blocking the water from draining into the sewer pipe. If the water level in the toilet bowl rises when you flush, DO NOT FLUSH AGAIN or you will overflow your toilet. If you thought your toilet bomb was embarrassing, imagine mopping it up off the floor. Solution: Hopefully, there is a plunger nearby. If so, stick it in there so that it covers the large drain hole in the bottom of the toilet. 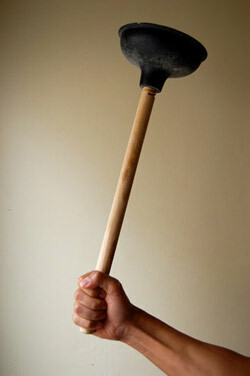 Don't worry about getting the plunger dirty — that's what they are for. Press it down evenly, then pull up fast. Do this a few times and you should be back in the flow. If the water level goes down to normal, it's probably safe to flush and you're back under the covers. No plunger? You're going to have to improvise. Try to break up the offending item until it makes its way down the pipe. You will have to use a coat hanger, toilet brush, wooden spoon, any available long pokey thing, or (God forbid) your hands in a pair of rubber gloves. Note that if the toilet tries to overflow even when you don't flush — like, say, when the laundry room is busy — call a plumber. Solution: If nothing happens when you flush AND the cistern is full of water, take a deep breath and pat yourself on the back. This is an easy one. First check the flush handle. Inside the cistern, the flush handle becomes a bent rod with three or so holes. One of these holes should have a chain hooked into it. If nothing at all happens when you flush, it's probably because this chain is not attached to the handle. You should see a loose chain somewhere, with a hook on the end. Attach the hook to one of the holes in the rod that is connected to the flush handle. The middle hole is usually fine. The chain should be loose enough that the hatch stays down, but tight enough that the hatch opens when you flush. If it's a little off, try a different hole. If it's way off, improvise. Too loose: try hooking a couple of links in the chain to shorten it before attaching it to the handle. Too tight: use a twisty-tie through the hole, creating a loop, then put the chain hook through that loop. If the rod attached to the flush handle is broken, you will have to go to a hardware store and buy a new flush handle. For now, just pull the chain, lifting up the hatch, and the toilet should flush normally. Whew! Problem: The cistern is empty, and water keeps running. Solution: This is probably the second most common toilet problem. The hatch is usually the culprit, staying open when it should close. Try jiggling the flush handle, and see if it drops. Look for a kink in the chain and untwist it, if necessary. Also, make sure there are no marbles, toy dinosaurs, rocks, or similar objects in the way, blocking the hatch from closing. Also, check that the float is actually floating. If not, take it and ten bucks to the hardware store to get a new one. Okay, you're starting to panic. Nothing in the Oh Crap! guide is working! She's on her way back into the bedroom! Didn't I tell you to stay calm? Solution: The float might be stuck. If the float is up out of the water, push it down and watch the cistern fill like magic. If this happens a lot, replace the float. Still no water? Check the shutoff valve, which is a little faucet near the base of the toilet. Turn it counter-clockwise until completely open. It may be hard to turn, but you shouldn't need tools, so don't force it. Problem: None of that worked, and she's knocking on the bathroom door! Solution: Here's a neat trick that works every time, as long as the bowl is not stuck or overflowing (remember, you don't want to mop this mess up off the floor). Fill a large bucket with water (at least a gallon) and dump it right into the toilet bowl, as quickly as possible. Same as a flush. Spray some deodorizer or light a match, to get rid of the awful scent, and you're home free, smelling … almost … like a rose. Spend five bucks on a toilet brush (for your own bathroom — your girlfriend already has one). If you drop a serious bomb, you might leave some streaks in the bowl after you flush. While you may be proud of your ability to let loose, nobody else wants to see it, especially her! Give the bowl a quick brush, and flush again if the water looks a little chunky. Congratulations! We've diverted an emergency, but now she says her toilet is leaking, the faucet is dripping, and everything under the sink is getting wet. Next time, we'll show you how to impress your girl with a few quick plumbing fixes that every man should know. HAHAHA This is amazing and practical. “Spend five bucks on a toilet brush (for your own bathroom — your girlfriend already has one).” I laughed for 5 minutes when I read this. this article is cool. also check under the shelf for dran-o. PROBLEM: you run out of tp. Derrick, just wait til you move in w/ her and YOU are the one paying for the decerative hand towels. You guys are mistaken. Thats why you always hold on to old receipts. Hell I have enough “Macgyver paper” to get me through 2 or 3 emergencies at the moment. Actually, a real man would just hold it till he got home or found a public toilet. There’s just no excuse for taking a casual dump at someone else’s apartment. Until you are at the point in your relationship where you both can rip a fart in front of each other and laugh about it, you best not think about fouling up her bathroom with your nasty fast food diet pooh smell. Women’s sense of smell is much stronger than men’s and even if you think it smells fine in there after you do it, she will know and not think too highly of you for it. Light a match….are you kidding??? You think the smell of rotten eggs (sulfur) is going to improve the situation? You just gotta tough it out soldier until you find a safe haven for dropping your bomb! What happened to the good ol’ outhouse? This didn’t used to be an issue. After running into that problem before. Now I make up an excuse to take a shower. Then I would go into the bathroom take care of business and proceed to take a shower. If I ran into any toilet problems I would run the shower to find time to fix the situation. When I solved the problem I would take a quick shower. 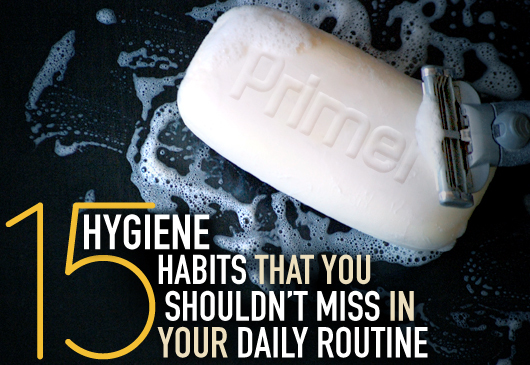 The smells of the soap and shampoo hide odors well too. If all else fails pick up that bid dude and chunk it out the window. No window? Wrap it in a towel and carry it outside and bury it before she catches you with it wrapped up in her favorite designer towel! Definitely have to run the shower, its the best way to do it! Reading this makes me laugh but there is nothing wrong in this, such situation always occurs and people handle this in the same way as mentioned here. Gee, even elite girls are too chill for you, hm? Then again, I will be the first to tell you that I hang out with too many friends that are men. I unclogged the toilet the other day. I took some fiber pills last night and my poop got stuck in the pipes. The ball plunger isn’t working. It flushes but the water fills the bowl up to the very top but slowly goes down. Should I call a plumber?